Create a style of contemporary sophistication in your kitchen, bathroom, or home office with the addition of a beautiful glass countertop from Clayton's Glass. Made from eco-friendly materials, these low maintenance custom glass countertops reflect an abundance of light while providing unmatched hygienic qualities and durability. Achieve a remarkable blend of function and art through the variety of thicknesses, colors, and textures available. For a distinctive look that is sure to impress, choose the eye-catching translucent beauty of a custom glass countertop. 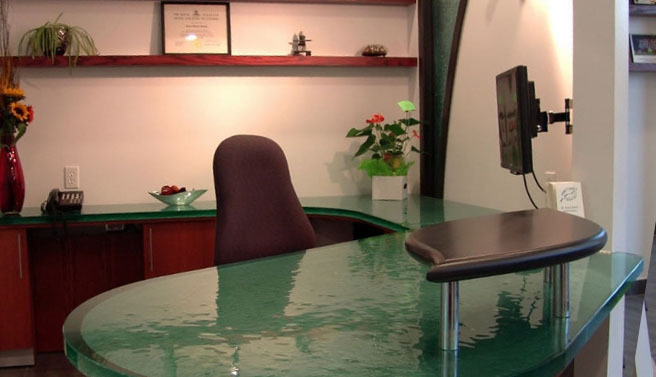 to start designing your new custom glass countertop! 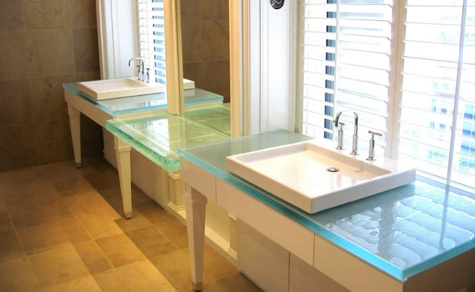 Glass countertops from Clayton's Glass, although practically indestructible, are made of tempered safety glass to prevent shattering if the glass does unfortunately break. The finished and polished edges of the countertops are just as smooth as the surface; however, some of the texture may pass to the edge for an extra aesthetic appeal.